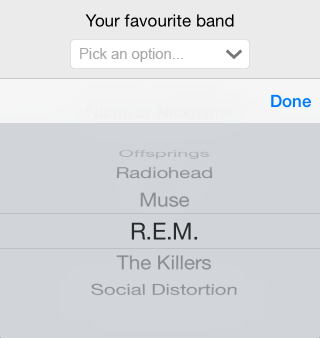 DownPicker is an extremely light-weight class library for creating DropDownList / ComboBox controls for iOS that will behave like their HTML / Android counterparts. You'll only need a standard UITextField and few lines of code. It's as simple as that. You only need to provide an array of data. NOTE: If you don't like the control wrapper approach, you can also use it as a custom control via the included UIDownPicker class: read the following paragraph for more info. DownPicker is basically a control interface wrapper, meaning that you won't use it as a control - it will use an existing UITextField control instead. This is a good thing, because you'll be able to design, positioning and skin your UITextField like you always do, programmatically or inside a Storyboard UI, depending on how you are used to work. You won't change your style, as it will adapt to suit yours. However, if you don't like the control wrapper pattern, you can just use it as a custom control using the included UIDownPicker class. It's entirely up to you (and very easy to install in both scenarios). Download the latest version from this link, then unzip & drag-drop the /DownPicker/ folder inside your iOS project. You can do that directly within XCode, just be sure you have the copy items if needed and the create groups options checked. Once you have DownPicker installed and included in your project, you can either use it as a Control Wrapper or as a Custom Control: the choice is up to you, depending on your programming style. That's it. You can retrieve the user's choice at any time using self.datePicker.text or textField.text. You can then customize it using the inner DownPicker public property. defer data loading using the [self.downPicker setData:array] method. disable the right arrow image using the [self.downPicker showArrowImage:bool] method. use a custom right arrow image using the [self.downPicker setArrowImage:UIImage*] method. You can use [UIImage imageNamed:@"yourCustomImage.png"] to set any image in your project. configure (and/or localize) the placeholder text string using the [self.downPicker setPlaceholder:NSString*] and [self.downPicker setPlaceholderWhileSelecting:NSString] methods. retrieve, customize and hook on the inner UIPickerView control using the [self.downPicker getPickerView] method (use at your own risk). retrieve, customize and hook on the inner UITextField control using the [self.downPicker getTextField] method (use at your own risk). Remember that it's the exact same control you passed, so you might prefer to use your main reference instead. More customization options (give me your suggestions). Dynamic data-binding. ... and more! You can support this project's development by clicking on the following button. DownPicker is available under the MIT license. See the LICENSE file for more info. Downpicker is maintained by Darkseal. This page was generated by GitHub Pages using the Cayman theme by Jason Long.